In many cases, blackberries with algal spots will still produce a good crop of berries, but in the right conditions and when severe the infection can really take a toll on canes. It’s especially important to look for signs of algal spot if you are growing blackberries in a warm and humid climate. A bad infection could kill your plants. Very few species of algae infect plants, but one, Cephaleuros virescens, infects and causes damage in blackberry canes. When the infection is mild, it doesn’t cause much damage and the canes will still produce good fruit in abundance. However, when the infection spreads, it can girdle the canes or even cause splitting that allows other infections to set in, and ultimately this can damage the canes enough to kill them and severely limit the crop. The infection causes light green to yellow or orange velvety spots to form on canes, which is why the disease is also called orange felt or orange cane blotch. The spots begin near the base of canes and will be more prevalent there than higher up. The spots get more orange in color and fuzzier as the infection continues. When the conditions are right—warm and wet—the spots will merge and ultimately cover or girdle the cane. To distinguish between algal spots and a rust disease, rub the orange spots. If the color comes off on your fingers, it is a rust disease. If it stays put, it is more likely Cephaleuros of blackberry. The spots typically begin appearing in early summer and grow larger and merge in the fall. There are many methods of cultural control you can try to manage algal spots on blackberries before turning to chemical interventions. To prevent spreading the infection to new canes, for instance, trim back old canes after harvesting berries and destroy them. Use drip irrigation instead of overhead to reduce standing moisture on the canes. Keep them well trimmed and keep the area underneath weed-free to promote air flow. Make sure your canes are planted in a spot that drains well. 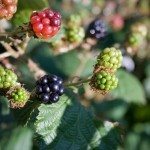 You can also help your blackberry canes fight off the infection by providing them with the appropriate soil amendments and fertilizer, as well as adequate water without over-watering. 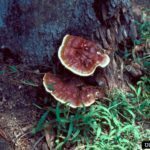 If the infection gets severe, you can try a copper fungicide spray. Read more articles about Blackberries.